2 Schlafzimmer 2 Bad, 5 min zu Fuß zum Strand, beobachten Sie die Wale von Ihrer Terrasse. Willkommen im 6202 Casa Sue! Das direkt am Meer neu renovierte Zwei-Zimmer Wohnung befindet sich auf den Klippen von Misiones und nur wenige Minuten von der Innenstadt von Cabo San Lucas entfernt. Der Blick aufs Meer ist atemberaubend und Walbeobachtung von November bis April kann auf der Terrasse genossen werden, entweder auf den Liegestühlen in der Sonne des frühen Morgens oder abends auf den Sonnenuntergang Schnitt Couch. Ein Wet-Bar auf der Terrasse, ein Minikühlschrank, und Edelstahl-Grill sind nur einige der wunderbaren Eigenschaften, nicht auf die 75-Zoll-Smart TV im Wohnzimmer mit Satelliten-und WLAN-Internetzugang zu erwähnen. Die Küche ist sehr schön mit Kupfer Waschbecken, Arbeitsplatten aus Granit und Edelstahl-Geräte konzipiert. Für Ihre Bequemlichkeit umfasst der Kühlschrank eine Eismaschine und gefiltertes Wasser. Das Resort verfügt über zwei Strände; Monument Strand ist ideal für den erfahrenen Surfer und Cabo Ballo Strand ist ideal zum Schnorcheln, sammeln Meeresschätze oder einfach nur Entspannen und Sonnenbaden. Zwei schöne Pools, einer mit Blick auf das Meer und das andere verfügt über eine Swim-up-Poolbar. Casa Sue hat alles, was Sie brauchen, um Ihren Urlaub perfekt zu gestalten. Schnorchelausrüstung für zwei, Sonnenliegen, Sonnenschirm für den Strand, Kühler und Strandtücher. Bringen Sie einfach die Corona und Sie sind alle für den Tag! Das große Schlafzimmer verfügt über ein Kingsize-Bett, ein eigenes Bad und Terrassentüren, die auf das Deck. Wenn dies ein Arbeitsurlaub, dann ist ein Schreibtisch und WLAN-Drucker zur Verfügung. Das zweite Schlafzimmer ist mit einem Doppelbett und ein großes Fenster mit Blick auf den Ozean. Die Wohnung verfügt über eine neu installierte Klimaanlage, Edelstahl-Geräte, einschließlich Geschirrspüler und viele Gadgets zum Kochen oder machen Sie Ihre Lieblings Margarita! Die neue Costco und Wal-Mart sind alle weniger als eine Meile entfernt und eine Mini-Mart ist nur wenige Minuten in Fuß am Sunrock Hotel. Im Hause Chef und Wellnessangebote sind für die verwöhnten Leben Design. Ihre nächste große Entscheidung ist die Buchung Ihres nächsten Urlaubs bei 6202 Misiones - Casa Sue. Die Besitzer sind sehr stolz auf ihre Cabo Hause und wollen alle ihre Gäste zu genießen und lassen Sie sie ihre Heimat für ihren Urlaub zu sein! This condo had everything we needed. Well equipped kitchen, loved the outdoor kitchen for grilling in the evening. We spent most of our time in the outdoor space. Nice views of the Sea of Cortez. Private sunbathing space with a beautiful view of the water crashing on the rocks below. There was a private beach, nice swimming pool with swim up bar. Nearby restaurant to watch fabulous views of sunset. Be sure to get good directions on finding the condo. Our GPS was a little out of kilter when we first arrived and we wasted a bit of time locating the condo. This is a great condo for two couples. There were no surprises, it was just as described. Our family of 4 (parents, 2 teens) visited this condo in March 2019. The pictures of this condo don't do it justice. The patio is simply amazing - we spent so much time out there, switching between talking on the couch, grilling steaks on the bbq, playing games at the table, and sunning in the lounge chairs. We brought binoculars and were even able to whale watch from the patio. I can't imagine another condo on the property has a nice of a view and as perfect of a layout as that patio. Other pros: 2 big bedrooms, 2 big bathrooms (no one felt crowded), TONS of storage space, washing machine saved us from packing more than we needed because we could re-wash some shorts and tank tops, fully stocked kitchen, fantastic huge TV (we logged into our own netflix acct and watched a few movies over the week), more than enough towels, beach towels provided (so nice), and we used the beach umbrellas, chairs, and the cooler when we went to the beach. Lastly, you can hear the ocean everywhere from inside the condo!, so relaxing. We rented a car ($160 for the week including mexican insurance) and it was so worth it. We went to Walmart twice to get groceries, sunscreen, and bottled water. And with the car, we were able to drive to the public beaches, which are beautiful and free. This meant avoiding booking an expensive catamaran and being able to stay as long as we wanted and shift between snorkeling, bobbing in the waves, and sitting in the sand. We loved Santa Maria beach and Chileno Bay (both just a couple of miles down to the road from the condo). You can't swim at the beach by the condo (rocky and huge waves), but we took morning walks down to the water every day. And again, there are amazing beaches just down the road. Our checkin was with Diana G, and she was SO kind even though we were late (took 2 hours to get our car rental due to a very long line, which we hadn't anticipated). She greeted us with chips and salsa and some coronas, showed us the property, where to park, etc, and then left to let us start relaxing! Kristen Bravo also helped us book a last-minute ATV tour, which was so very helpful (we were having such a hard time finding an open tour ourselves online - she was able to hook us up right away). It couldn't have been a more lovely week. Such a fantastic property, great staff to work with, and beautiful setting. We had such great family time enjoying the ocean and each other. Thank you!! Hola! Thank you for taking the time to leave a review on Casa Sue! We are so glad you had a great time and enjoyed the condo! We welcome you back on your next vacation to Cabo! Thank you! Perfect condo for 2 couples that love to cook outdoors! Fabian made sure we have plenty of propane for the grill, he was most helpful and accommodating, thank you. The condo is very well equipped. Terrific sunrise. Both beds are remarkably comfortable. I highly recommend 6202! Thank you for taking the time to leave a review on Casa Sue! We are so glad you had a great time and enjoyed the condo! We welcome you back on your next vacation to Cabo! Thank you! It was a pleasure staying at this condo. We have rented many times and this place was definitely one of the nicer condos. Well stocked, clean,nice amenities and OH What a View! Fabian met us upon arrival and took us to let us in. He was a phone call away if any questions presented themselves. We highly recommend and would definitely stay here again. Thank you Kristen for helping us set this vacation up. Hola! Thank you so much for taking the time to leave a review on Casa Sue! We are so glad to hear you had a great time and enjoyed the condo! 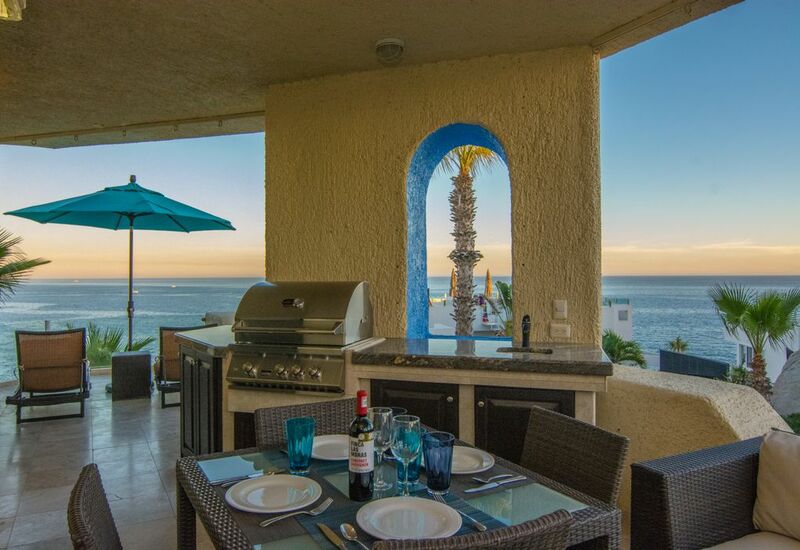 The view is a favorite and the condo is perfect for a vacation getaway! We welcome you back on your next vacation to Cabo! Thank you! We thoroughly enjoyed our stay in this condo. The ocean view was amazing. We saw many whale blows and breaches from our patio during our 9 day stay. Everything was clean and well stocked (from dish soap to beach towels) when we arrived. We took advantage of Prickly Pear service and had groceries delivered prior to our arrival -much appreciated as we arrived late in the evening. The beds were very comfortable and we fell asleep to the sound of waves each night. Staff at the pool bar and grill on campus were friendly and helpful. Thank you Andres! We will be back!!! Everything in the Condo was great but the floor. The tile is so uneven, make sure you wear socks or shoes. It's clean, grounds are beautiful and all the staff very friendly. Love being right on the ocean to hear the waves.The bed was one of the best firm and you sink into it for a good night sleep.The condo had everything 2 to 4 people need for a relaxing stay. Hola! Thank you so much for taking the time to leave a review on Casa Sue! This is the first we have heard of an issue on the tile as the condo had new tile recently installed. We are so glad you had a great time and enjoyed the condo! We welcome you back on your next vacation to Cabo! Thank you! 5 min zu Fuß zum Strand und Restaurants. Das Hotel liegt auf dem Flur in der Nähe von Costco, Walmart, und der Innenstadt Cabo. Im Home-Spa und Küchenchef Dienstleistungen, willkommen margarita party, Aktivitäten, alles, was Sie von hier denken können!